Dubai: The Duty Free International Weekend continued to serve up plenty of thrills and excitement on Day Two at Newbury Racecourse in the UK where Kessaar ran out a compelling winner of the featured Group 2 Dubai Duty Free Mill Reef Stakes. Ridden confidently by Frankie Dettori for trainer John Gosehn, the two-year-old son of record-breaking German stallion Kodiac crossed the line 2¾ lengths clear of True Mason and will now likely to be aimed at next week’s Group 1 Middle Park Stakes at Newmarket. Earlier in the afternoon, former Derby-winning trainer William Haggas sent out Young Rascal to capture the Dubai Duty Free Legacy Cup Stakes. 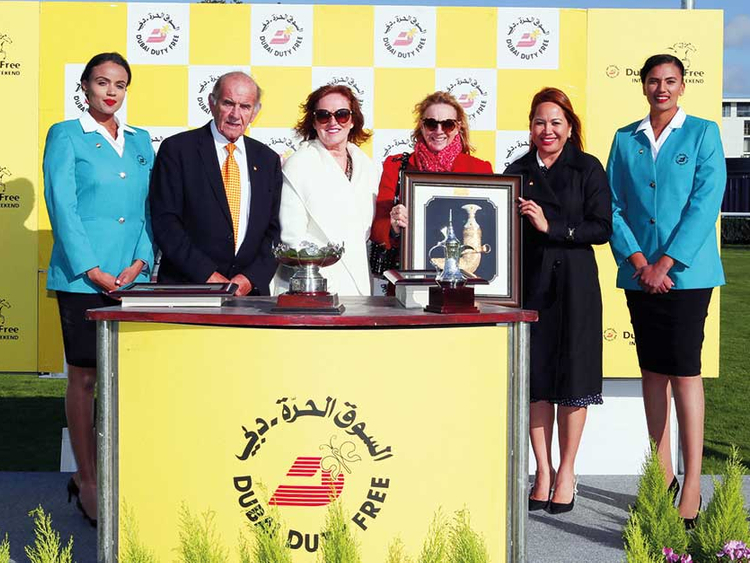 The Dubai Duty Free International Weekend, which brings the curtain down on Dubai Duty Free’s international portfolio of sponsorship on the flat, has been a happy hunting ground for Dubai-owned horses. On Friday, the Listed Dubai Duty Free Cup over seven furlongs was won by Mankib owned by Shaikh Hamdan Bin Rashid Al Maktoum, Deputy Ruler of Dubai and Minister of Finance. Trained by William Haggas, Mankib has now won three of his four starts this season including over this course and distance back in July. William Haggas’s wife Maureen, daughter of the legendary jockey Lester Piggott, paid tribute to Shaikh Hamdan’s Shadwell Stud who had looked after Mankib when he arrived from France. Mankib was chased home by Good Effort in the colours of Abdullah Al Mansouri to ensure a Dubai one-two finish in the contest. The first day’s action concluded with The Dubai Duty Free Full of Surprises Fillies’ Conditions Stakes also over the straight seven furlongs course for two-year-olds, which was won by Fashion’s Star, whose owner, Andrew Rosen is making it a habit of winning races sponsored by Dubai Duty Free. In April this year J Wonder, trained by Brian Meehan, won the Group 3 Dubai Duty Free Stakes, also at Newbury.